Already premiered by Annie Mac + Benga & Skream on BBC Radio 1 last week with support from Disclosure, Modeselektor, Ben Westbeech, Tensnake, T. Williams, Jimmy Edgar, Wolf&Lamb, Axel Boman, Erol Alkan, Maxxi Soundsystem and many more. 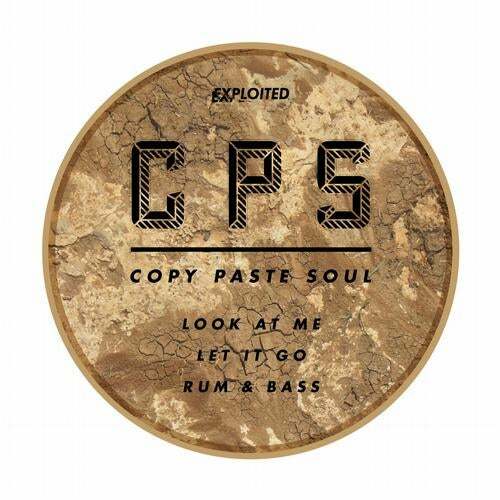 2012 has witnessed the rise of new producer, Copy Paste Soul. CPS recently signed up to Berlin label Exploited . Leftfield deep house with just the right amount of wobbly filth from this London-based producer. Early Feedback: MODESELEKTOR: Gute Platte. TENSNAKE: Look At Me should be a big hit but all tunes deliver. Thanks, downloading. AXEL BOMAN: COOOL! Really like "Look At Me". Great release! NOIR: NIce release. Really good productions. ZEV/WOLF&LAMB: Nice work boyz. MAXXI SOUNDSYSTEM: Damn good EP! LAURENT GARNIER: Pure dancefloor power. Looove this. CHOPSTICK: Rum & Bass is a dope tool TILL VON SEIN: Cool EP! All 3 trax solid tools for my sets. ROUND TABLE KNIGHTS: Big fan of Let it Go! Looking forward to hear more from CPS. CHRISTIAN PROMMER: Wow. Great Soulful indeed. Gimme more. Luvin it from the start. RALF KOLLMANN: Starke Platte! Top. ANDRE CROM: Amazing stuff. Full support. FAKE BLOOD: I'm into Let It Go. It's got that Strictly Rhythm '91 type vibe that I was all about as a youth. ETIENNE TRON: Pretty impressive! All tracks are big. Nice discovery. EROL ALKAN: Thanks. KOLOMBO: Nice EP! AGORIA: Huge support. Will play it a lot this weekend in Chicago and Montreal. WORTHY: AHH DAMMM!!!! Wicked release, going straight to the bag. HOMEWORK: Ah, this sounds fresh! Sweet. Nice addition to the Exploited family. ORGASMIC: Hard to pick the winner on this one. Such a good EP. Every song is so good and the sound is really really impressing. Will play in the Sound Pellegrino Podcast and gig as well. PEZZNER: Totally what I needed for the weekend. Thank you for this! CAJUAN: Terrific. Love it! JOYCE MUNIZ: Yeah ! Great EP. Full support !! DIGITALISM: Thx. BAG RAIDERS: Nice and fresh! Feeling the whole release.. ALEX BARCK: Fresh ! Straight in my box. ANDY GEORGE: Dope EP, Look At Me is really cool - will be playing for sure. HANNAH HOLLAND: Big sound. My fav is Rum & Bass its got the energy for me! CHRIS JAMES: SERIOUS, BEST EP IVE HEARD IN AGES. STEFANO RITTERI: All 3 tracks are in my set! My favourite is Let it Go, but they all work so nice! MONTE: Let it go for me ! THX. DEN ISHU: Top release - love every track !!! thanks. RUEDE HAGELSTEIN: Crrrraaaaaaaaaaaaaaaaaaazy good. MERCURY: Let It Go yessirLove it. SINDEN: Fine release! Look at me is great. MARTIN LANDSKY: Rum & Bass for me here.... THE MEKANISM: SUPPORT AS ALWAYS :D LAZARO CASANOVA: Very cool EPthanks for sending.